The UL 489 Series miniature molded case circuit breakers are DIN rail mountable and provide feeder and branch circuit protection per UL 489. Typical uses include convenience receptacles, motor controls, load circuits leaving equipment, and heating and air conditioning. 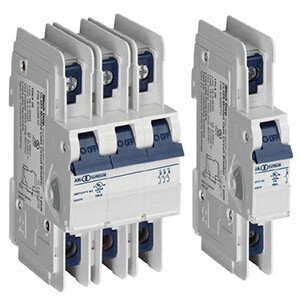 UL 489 Series miniature circuit breakers are available in one-, two-, three- and four-pole configurations and up to 23 different current ratings from 0.3A to 63A and can safely be used in applications up to 480Y/277 Vac with a 10kA short circuit withstand rating. Low inrush motors, resistive loads, wiring protection, receptacles, lighting, and control circuit applications. Relatively short thermal trip delay and medium magnetic trip point. High inrush motors, transformers, power supplies, heaters and reactive loads. Relatively long thermal trip delay and very high magnetic trip point. Telecommunication equipment, computer equipment, uninterruptable power supplies. Note: Note: (*)= ”C” for C-curve and “D” for d-curve.